The ratings are in, and a lot more people watched Monday night's college football national title game than Oprah Winfrey's buzzy speech at Sunday's Golden Globes. Alabama's come-from-behind, 26-23 victory over Georgia on Monday averaged 28.4 million viewers on the ESPN networks, a 13-percent increase from last year's title game between Alabama and Clemson. It was the second-most watched cable news presentation ever, according to ESPN. The game, which went to overtime, peaked at 30.7 million viewers. 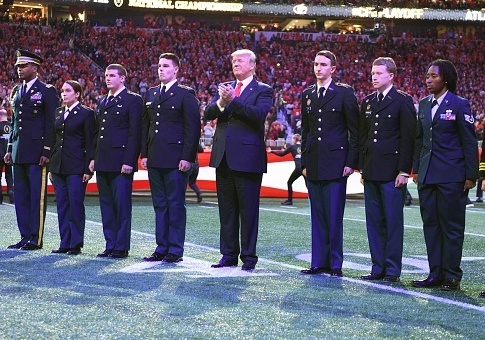 President Donald Trump attended the first half of the game in Atlanta and stood on the field for the national anthem. The Seth Meyers-hosted Golden Globes drew 19 million viewers on Sunday, a 5-percent decrease in viewership from last year's awards hosted by Jimmy Fallon. At the show, Winfrey received the Cecil B. DeMille award and gave remarks about her life, the #MeToo movement against sexual harassment, and gender equality that received high marks in the media. It also raised speculation she might consider running for president, but sources in her orbit have given conflicting accounts over how seriously she's considering such a decision. This entry was posted in Politics and tagged Football, National Anthem, Oprah Winfrey. Bookmark the permalink.